Dr. Darin Detwiler, LP.D., M.A.Ed., is the Assistant Dean of Academic and Faculty Affairs at Northeastern University’s College of Professional Studies in Boston, MA. 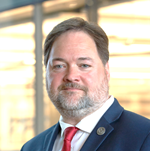 He is also an Assistant Teaching Professor of Food Policy who serves as the lead faculty for the college’s MS in Regulatory Affairs of Food and Food Industry program. He is the recipient of the College of Professional Studies' 2016 Excellence in Teaching Award. An internationally recognized, respected, and well-connected food policy and technology expert with 25+ years’ experience in shaping federal food policy, consulting with corporations, and contributing thought leadership to industry events and publications. Recipient, 2018 “Distinguished Service Award,” International Association for Food Protection. Regarded as “One of America’s leading food safety advocates.” In 2004, the Secretary of Agriculture appointed Detwiler to two terms on the USDA's National Advisory Committee. He later advised the FDA as the Senior Policy Coordinator for a leading national food safety advocacy organization. With over 20 years of teaching experience, Detwiler taught high school math, biology, environmental science, physics, forensic science, and history (world, U.S., and state) as well as middle school U.S. history. He is the recipient of the 2013 Washington State Governor’s Award for Excellence in Teaching, the 2013 Washington State PTA Outstanding Educator Award, the 2009 AMGEN "AASTE” Award for Science Teaching Excellence (Biotechnology), King County (WA)'s Earth Hero Award (for Environmental instruction), and the 2003 National Science Teachers Association / Toyota TAPESTRY Award for Innovation in Science Literacy Education. He holds a B.A. in History, a B.Ed., and an M.A.Ed. in Curriculum and Instruction. In addition to his work at Northeastern, Dr. Detwiler is a sought-after speaker and contributing writer for various publications. He is a columnist and Editorial Advisor for Quality Assurance and Food Safety Magazine. His other media work includes print (such as N.Y. Times, Chicago Tribune, L.A. Times, and Food Quality and Safety Magazine) and broadcast appearances (such as CNBC, NPR, Good Morning America, CNN, and PBS.) He serves on multiple advisory boards within the food policy arena. Detwiler is writing a book "Food Safety: Past, Present, and Predictions" for Elsevier Publishing. Dr. Detwiler is a U.S. Navy Nuclear Submarine Veteran who holds a Doctorate in Law and Policy from Northeastern University. Leads efforts towards quality assurance, student and faculty success, and working cross-departmentally to drive enrollment goals and bring new programs to market. Revised the Regulatory Affairs of Food program to allow for a restart with improved curriculum aligned to industry needs. Worked with multiple programs and departments to increase collaboration, instructor presence, assessment, and use of technology. Federal Food Policy Consultant, trainer, motivator, speaker. My Food Job Rocks Podcast: "The Importance of Food Safety with Dr. Darin Detwiler..."